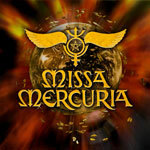 Missa Mercuria is a progressive metal opera which was released in 2003. All lyrics are by DC Cooper (Silent Force), the music was written by Gunter Werno, Stephan Lill (both Vanden Plas), Alex Beyrodt (Silent Force) and Alfred Koffler (Pink Cream 69). A great progressive album with a lot of melody featuring both easy and heavy songs and also some instrumentals. Story and all rights by Karin Forstner, Mercuria Media Enterprises. Produced and engineered by Dennis Ward (Angra, Pink Cream 69, Vanden Plas, D.C. Cooper) at the House of Audio Studios in Karlsdorf/Germany. Mixed by Achim Köhler (Primal Fear, Silent Force, Sinner) at the House of Music Studios in Winterbach/Germany.